Option two offers greater flexibility in terms of machine connection and increased “A” dimension for greater reach. A two-piece system that offers a saw blade flange and intermediate rings or spacers mounted on an arbor. The precision saw blade flange is designed to accept saw blade diameters up to 350 mm (14”) with a 60 mm bore and is secured with 6 countersink screws. This attachment with the countersink screws allows the saw blade to run with in close proximity to the machine bed. Depending on the “A” length desired, there are three intermediate rings or spacers available to achieve the desired overall reach. 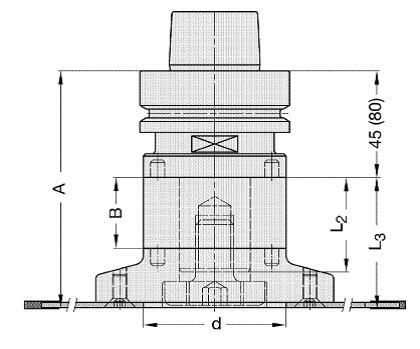 With the corresponding spacers, this allows for an “A” dimension of 100, 115, 140 or 176 mm. The greater length is ideal for machining thicker material or specialty applications commonly found in the millwork and door and window industries. 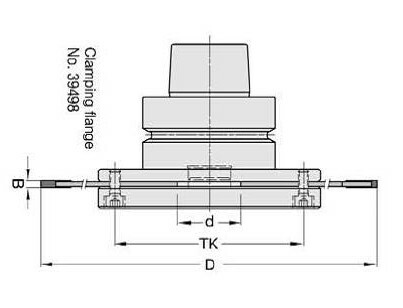 Depending on the machine and motor connection, arbors are available with HSK63F, HSK63E, ISO30 and SK30 connections. Once assemble, the entire unit offers precision machining of a variety of applications and materials. Depending on the application, a variety of standard saw blades complete with the required bore and pinholes are readily available and custom blade setups are also possible. 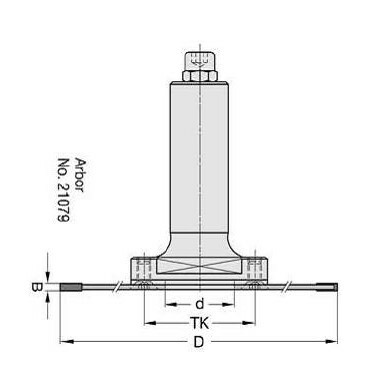 In addition, as a third option, there is a basic saw blade arbor adapter that has a 3/4″ or 25mm shank, which can accept saw blades up to 200mm diameter. And, of course, when the saw blade needs to run vertically, you will need an aggregate head.